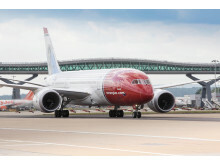 “Our hiring in the UK has been well received and many pilots are keen to be based at London Gatwick and work for an innovative and forward-thinking company that offers highly competitive wages and conditions as well as the opportunity to fly the most technologically advanced aircraft in the skies today, the 787 Dreamliner,” said Director of Flight Operations Torstein Hoås at Norwegian. Recruitment of Gatwick-based cabin crew will take place early next year. Norwegian is also recruiting pilots to its JFK base, where the company already has a cabin crew base. Norwegian has quickly become a major player at London Gatwick, where the airline offers direct routes to popular destinations. The company was earlier this year voted “Best Value for Money” in the UK by Sky Scanner. Meanwhile, in July this year, Norwegian was awarded the title “Best Low-Cost Airline in Europe” for the second year running by the renowned SKYTRAX. Norwegian opened a crew base at London Gatwick in 2013 where the company now has 90 pilots and 200 cabin crew members based for its short haul operation. Norwegian will carry more than three million passengers to and from London Gatwick during 2014 and currently has 400 weekly flights and 41 routes operating from the airport. In July this year, Norwegian celebrated its first flights between London Gatwick and three US cities; Los Angeles, New York and Fort Lauderdale. Launching long-haul routes between London Gatwick and the United States is also an important part of Norwegian’s strategy to expand internationally and get a stronger foothold in global markets. Today, Norwegian has a long-haul fleet of seven 787 Dreamliners and ten more on order.